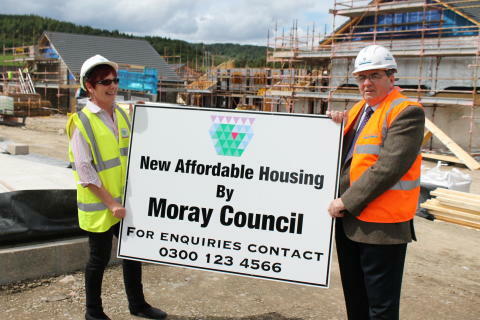 New council housing has risen rapidly from the ground in Dufftown since work started in March. Roofs are already on the 19 energy efficient houses, which are due to be completed by the end of the year. Yesterday local Moray councillors visited the site to review progress and were given a guided tour by construction staff. Eight of the houses are cottage flats, specially designed for older people. The brownfield site was previously home to a cooperage and an auction mart, and was purchased by Moray Council earlier this year to help meet demand for low-cost housing in Speyside. Councillor Fiona Murdoch said the development will make a big difference to Dufftown. “Having these homes in the heart of the town will add to its vitality,” she said. “Too many of our people have to move away because they can’t afford private sector houses, so this level of investment in our rural communities will make staying here affordable for many. 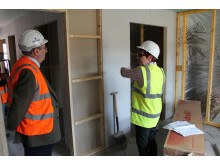 All the properties feature low-cost heating and energy systems which will help reduce fuel poverty issues for tenants. Now the properties are weather-tight the next phase of work will include the installation of kitchens, bathrooms and heating systems. The £2.5million contract was awarded to Elgin-based Robertson Construction, who have a 30-strong team on site. 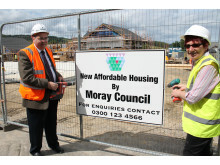 The properties are the first to be built by the council in Speyside in recent years and are part of a commitment to the building of 500 new homes across Moray over the next decade. Picture cap: Moray councillors for the Speyside Ward, Fiona Murdoch and Michael McConachie, at the site in Dufftown.